If you're tired of seeing your home being literally pulled apart at the seams, it may be time to invest in a cat scratching post for your feline companion. The right scratching post can eliminate those snagged couches, frayed chairs, shredded draperies, and carved doorways that result from a cat's natural need to sharpen her claws. 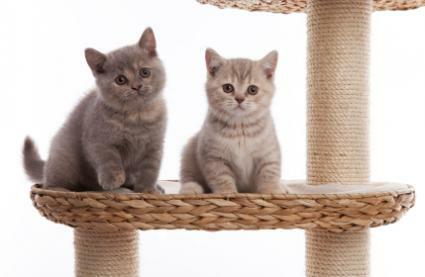 Some scratching posts are better than others, so it helps to look at some good examples before you make a purchase. The following posts represent the kind of height, stability and safe construction owners should look for in a scratching post. PurrFect Post: At 31.5 inches high, your cat can stretch out to scratch on this rough and durable sisal model. PurrFect's product is guaranteed not to topple, even when used by the most avid of scratchers. Ultimate Scratching Post: It's all in the name - this is the ultimate scratching post. This 32-inch, rough sisal model is both attractive and stalwart. Its flat 16 by 16 inch base fights against toppling and can be accessorized with a cat perch. The perch, however, is sold separately. There are plenty of scratching posts on the market, but a really good cat scratching post will have the following features. A good post should be tall, encouraging your cat to stretch and reach for some good clawing action. This helps her to keep those forefront muscles in prime condition. The type of material used is very important. If you hope to get your cat more interested in the scratching post than your furniture, the material needs to be enticing, and feel good beneath her nails. Sisal has become the preeminent material for cat scratching post construction because of its desirable rough texture and durability. Kitty can scratch to her heart's content. The more frayed the post becomes, the more useful it is to her. Stability is also very important. Since your cat will claw the post quite vigorously, it needs to stand firmly in place without toppling over, or your cat will not use it. Look for a cat scratching post with a wide base. It's a fact of life. Cats scratch, and there's no way of getting around it unless you choose to have your pet declawed. The question is, why do they do it? The answer? Scratching is a completely natural instinct for cats. Scratching helps cats shed the dead cells off their nails, keeping the nails sharp and in prime condition. The act of reaching up and scratching provides great exercise for a cat's muscles, keeping it toned and strong. Scratching is also a way of marking Kitty's territory. There are scent glands located in the pads of her feet that are activated by the pressure of scratching, and she uses this scent to let other cats know this patch of real estate belongs to her. Once you get a proper scratching post, the trick will be persuading your cat to use it. Not a simple task.Your first impulse may be to tuck the post into a corner as far away from your furniture as possible, but this won't do. You'll need to place the post right in front of your cat's favorite scratching places, because this is where she's already decided she needs to mark. Next, rub some catnip all over the post, so she'll immediately find it attractive. Once she does, some scratching is sure to follow. When Kitty is consistently using her post, you may be able to start slowly moving it further and further from your furniture, but remember to keep it in the basic area she's already chosen, or she may refocus on your couch. Refresh the catnip rub from time to time, just to keep things interesting, and hope for the best.